Going on holiday is something we all look forward to. However, we always feel a pang of guilt if we have to leave our faithful pets behind. In addition, arranging for care for your pet while you are away can be inconvenient as well as expensive. 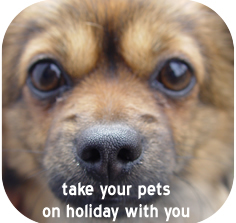 So... w e have a directory of holiday accommodation in the UK that allows you to take your pet with you. There are many types of holiday accommodation that allow pets. However, please bear in mind that it is important to check on the accommodation owners web site or contact them to ensure that the holiday accommodation meets your needs. It’s also worth considering that whilst many holidays allow pets some make a small charge. Taking your pet with you on holiday will allow the whole family to enjoy the beauty of Britain’s superb countryside and miles and miles of wonderful coast line. Walking your dog along the many coastal paths around England, Wales and Scotland can be a fantastic way of relaxing as well as getting plenty of fresh air and exercise. Holiday Cottages can be a perfect break with your pet. There is more room for you and your pet and many have private or shared garden areas for your dog to relax outside in. Also with more room and some properties being detached any noise is less likely to offend. Holiday caravans are also a good way to have a holiday with a pet. Some hire caravans and holiday parks allow pets as long as they are kept on a lead whilst outside. Check before you arrive any specific rules relating to your pet that may be of concern. Many of the campsites and holiday parks allowing pets will have dedicated dog walking areas. Hotels and guest houses that allow pets are generally rarer than self catering holiday accommodation. However, we have detailed the places that allow pets. If you are looking to get to your holiday by rail it can be a lot cheaper to purchase discounted advance tickets where prices are often cheaper. Ferry crossings are also available if you plan to go abroad as well as a flight comparison service. When travelling with a pet it is well worth checking with the operator as to their policy about pets. If you have pet insurance or are considering purchasing pet insurance then it’s well worth shopping around for the best deal. Deals4Insurance allows you to compare pet insurance quotes from a number of providers to find the right cover for you.